Bard MBA students made productive use of the spring, reaching the finals in three different international sustainable business competitions. On April 19th, team “Lead the Change” earned silver at the Patagonia/Berkeley Haas competition on the UC Berekely campus. 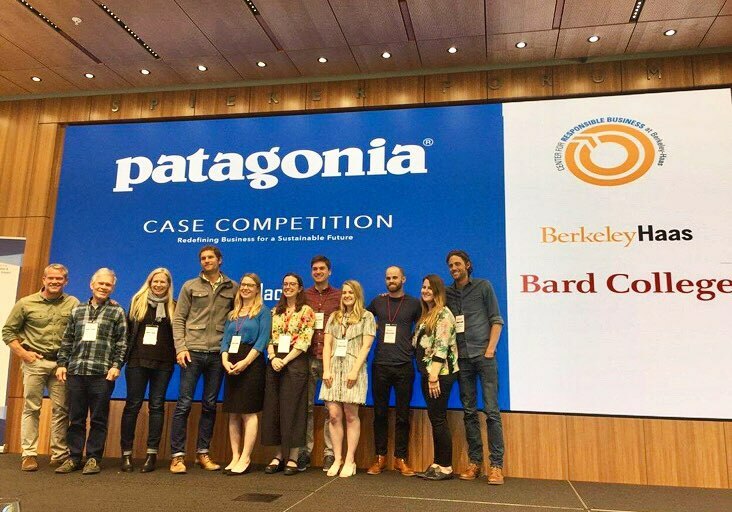 Five MBA students—Cory Skuldt, Alistair Hall, Savannah Parsons, Lindsey Strange, and Sam Brundrett—pitched Patagonia executives on how the innovative clothing company could become carbon neutral by 2025. The proposal was long on chutzpah, recommending that Patagonia cap production of new clothing by 2025 — while continuing to grow revenue and serve the needs of additional customers. The students detailed strategies such as leasing, expanded resale and repair, and production from recycled fibers. Lead the Change defeated MIT, Yale, NYU, the Universities of Michigan and Pennsylvania and three other finalists, from an original field of over one-hundred submissions, earning a trip to Patagonia Headquarters in Ventura California in June. There, along with the teams from UVA and third place Yale they will execute a deep dive into their business model with Patagonia employees—along with catching some rad surfing. They will also receive a cash prize of $5000. 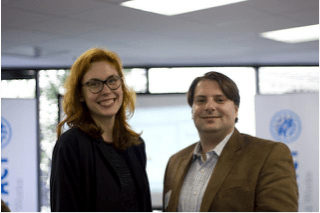 Just a week earlier, the Bard team “Enlightened Grain” travelled to Oakland, California as one of five finalists in the Net Impact Food Solutions Challenge. The team included Samuel Leavitt and Sarah Hutcherson, with Lindsey Strange in absentia as she competed the next week in person with the Patagonia crew. Enlightened Grain proposed a business based on using brewery grain to make a beer-inspired, highly nutritious and tasty granola. Currently, spent grain either goes to the landfill or for animal feed but this so-called waste is chalk full of fiber and protein, making it an incredible baking ingredient on which to build a business. The Enlightened Grain team had already won a spot as one of five finalists from an international field of one hundred thirty, along with UC Berkeley, Iowa State, Ashoka University and a professional team from Cameroon. The Oakland trip enabled the team to work collaboratively with the other teams and with experienced mentors to refine their business ideas. Enlightened Grain is now producing a final pitch video. Based in part on how the idea has progressed since the mentoring in Oakland, final winners will be chosen from among the five. The first prize? Five thousand dollars to help develop the Enlightened Grain concept into a real business. In one more competition, three separate Bard student teams beat out close to five hundred entries worldwide to become finalists, with two earning category winning spots, in the Aim2Flourish competition sponsored by Case Western University. Aim2Flourish highlights businesses around the world that are supporting the UN’s seventeen Sustainable Development Goals. Student teams in Professor Kristina Kohl’s Employees and Organizations class identified and researched businesses doing good work advancing the SDG’s. They then wrote up and submitted their cases. Luke Olson, Martin Freeman, Jesse Cutaia and Sam Levine focused a spotlight on American Prison Data Systems. By creating a technology platform for access to educational material, APDS is helping to build a more humane and effective prison system. This case won the competition supporting SDG#16 “Peace Justice and Strong Institutions”. Alistair Hall, Sven Thiessen and Amy Campbell submitted a case focused on Greyston Bakery, a Yonkers-based business that hires hard-to-employ, often recently incarcerated workers to make, among other things, brownies for Ben & Jerry’s. The Greyston case was selected as the winner for SDG#17 “Partnerships to Achieve the Goals”. Finally Reagan Richmond, Cindy Wasser, and Stephen Williams’s case presented Impossible Foods, a company that provides plant-based alternatives to animal products that taste as delicious as the real thing but have less environmental impact than factory farmed food. Impossible Foods was selected as a finalist in several of the SDG categories. The businesses featured as finalists and winners in the Aim2Flourish completion receive global recognition that can help advance their missions. The Bard MBA in Sustainability educates leaders to grow mission-driven businesses and nonprofits, and to transform existing organizations to focus on social and environmental purpose. Based in New York City, and operating in a one-weekend each month plus online format, the program offers the best possible academic training, real-world experiences, and career development opportunities that, together, enable our graduate business students to follow their passions and pursue successful, high-impact careers in sustainable business. To learn more, please visit www.bard.edu/mba.